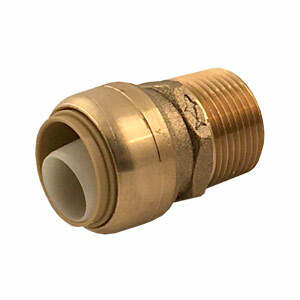 SharkBite Male Connectors combine innovative push-to-connect design with a standard MNPT adapter on the opposite end. The push-fit end is compatible with copper, PEX, CPVC, PE-RT or SRD9 HDPE pipes and can be installed with no solder, glue, unions or tools required. This fitting is designed for potable water and radiant heating (including underground or behind-the-wall) applications with no access panels required. It is rated up to 200°F and 200 psi.